Not every girl dreams of a big white wedding. Some girls – the ones who grow up in a large Irish family – dream about a traditional Celtic Handfasting. Now, I’m not a pagan by any means, in fact, the handfasting ceremony has come to be associated with neo-paganism when it actually pre-dates the modern traditional wedding ceremony. Have you ever heard the phrase “tying the knot?” That comes from handfasting. 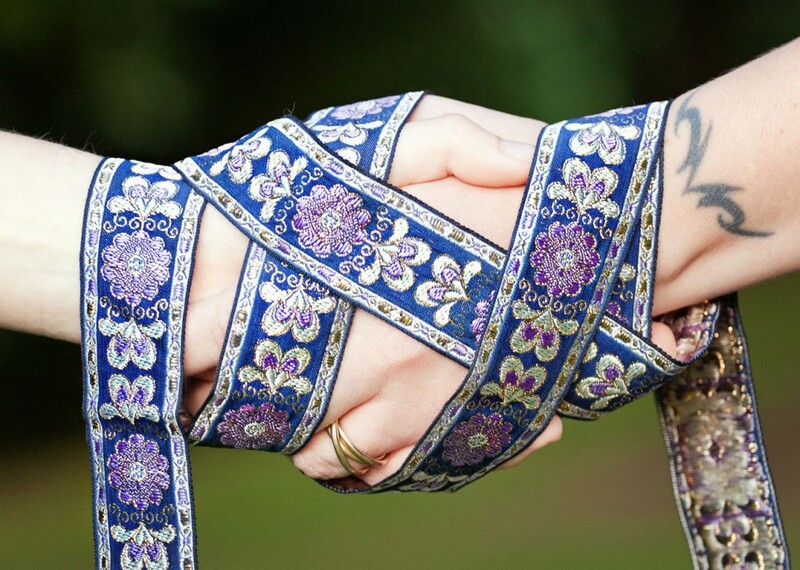 Handfasting can be religious or non-religious, anyone who tells you otherwise is historically misinformed. Even in early English manuscripts, when they spoke of Mary (the mother of Jesus) marriage to Joseph, the marriage was described as a handfasting. Obviously, Mary and Joseph never had a traditional Celtic handfasting ceremony, but the description just shows the prevalence of the practice. The tradition originated in the British Isles in the early Middle Ages when the religious elders decided to forbid secret marriages. The new law required that an officiant, typically a priest, as well as at least two witness, be present at the ceremony. The ceremony legally bound a couple together in marriage with a permanence that could only be removed with death. Fortunately for me, alternative wedding styles (despite hundreds of years of tradition a handfasting is currently considered “alternative” in the modern age) are easy to accommodate nowadays. After locating an officiant who had experience with handfastings, I set about preparing for the other details of the ceremony. The most important thing to me was undoubtedly the music. I don’t think a lot of people give too much thought to the music in traditional weddings. I’ve been to a few of them over the course of my life, and the processional is always Wagner or Canon in D, followed by Mendelssohn’s march. Then, at the reception, the DJ plays the same terrible pop music from the last thirty years. Nobody likes the music, but they all dance anyways – it’s not a pretty sight. Finding a Celtic traditional music group in Chicago proved to be less difficult than I imagined. I have a large extended family, and many of them play music – but I wanted something a bit more organized. So, I called up the music department at DePaul University and asked if any of the students or faculty specialized in traditional Celtic music and if they would be interested in playing at a handfasting ceremony. Lucky for me, one of the faculty violin professors led a traditional Celtic trio who did various gigs and events around the city. When I called him to see if he wanted to play at my handfasting, he was completely thrilled, agreed right away, and even e-mailed me a list of possible song choices. I decided on “My Lagan Love” for the song which played when my fiancé and I would walk into the semi circle and meet at the center beneath the tree. My grandmother, who is also my best friend, told me many years ago that when I married she would refashion her wedding gown for me. She spent many years as a seamstress working in Chicago, and had made clothes for me my entire life, and so she was preparing for me an extraordinarily rare and beautiful gift. My fiancé, now husband, isn’t Irish – but he loved my ideas so much that he agreed to everything. The only thing he objected to was having a goat as a ring bearer, because he worried it would make noise during the ceremony. I decided this was a compromise I was willing to make. We had our handfasting in June of 2010, beneath in Oak Tree in the Chicago suburbs. I wore my grandmother’s dress and my mother’s claddaugh, and made lifelong vows to my husband, and in turn, he made them to me.